Inventory We are a resale marketplace, not a box office or venue. Ticket prices may exceed face value. This site is not owned by Providence Medical Center Amphitheatre . Providence Medical Center Amphitheater opened in 1984 to be the prime outdoor concert venue in the Kansas City metro area. 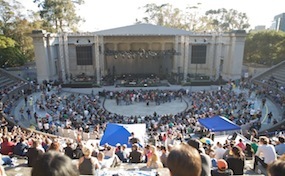 The venue was recently renovated in 2008 and has a seating capacity of 18,000. The Providence Medical Center Amphitheater box office is located at 633 North 130th Street in Bonner Springs, Kansas. The venue has changed names multiple times from the Sandstone Center for the Performing Arts, Sandstone Amphitheater, Verizon Wireless Amphitheater, Capitol Federal Park at Sandstone, and most recently the Cricket Wireless Amphitheater. Providence Medical Center Amphitheater tickets have included popular concerts like Elton John, Eric Clapton, Jimmy Buffett, Mumford & Sons, Rod Stewart, Neil Young, Dave Matthews Band, Red Hot Chili Peppers, and many more. ProvidenceMedicalCenter.AmphitheaterBonnerSprings.com is an independently owned and operated site that concentrates specifically in all online sales in the resale secondary market. We are not associated or affiliated with any official website, venue, box office, and or supplier. Ticket prices on our sites may be well below or above face value and can change quickly with market conditions. To order tickets to all Providence Medical Center Amphitheater Bonner Springs events please call our operators at anytime or follow the steps online through the checkout.